I love helping people feel better. Whether I’m explaining a complicated treatment plan in an easy-to-understand manner, or helping a person understand their insurance benefits, I’m making things easier for them. As a former dental assistant, I understand patients’ concerns and work to make sure everything is clear for them. I oversee the running of the office, from scheduling to insurance billing, and everything in between. I’m the indoorsy-type, especially tackling DIY projects. I enjoy refinishing furniture, browsing antique shops, cooking, and spending time with my daughter and husband. 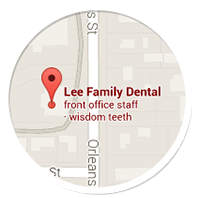 I love showing patients that being at our dental office can be a fun, enjoyable experience. It’s important that each person knows we provide gentle, painless care, and that this is a safe space. When a patient learns it’s okay to relax here, then we can really help them develop great oral health. I provide chairside assistance to Dr. Lee, making sure he has everything he needs and supporting the patient during their procedure. When I’m not at work, I enjoy hiking and spending time with my close friends. Going to Oregon to visit with my family is one of my favorite things. My work allows me to meet wonderful people from our community, and provide them with quality care that improves their lives. As I clean a patient’s teeth, provide periodontal therapy, and assess their restorative needs, I talk with them about dental hygiene and their lifestyle. The more I learn about their life, the better I can assist the person with home care recommendations and developing better habits, so they can enjoy a great smile for a lifetime. I enjoy life with my wonderful husband and daughter as well as our dog Duncan. I enjoy seeing our patients when they arrive and hearing their latest news. I like being part of their lives and making sure everything goes smoothly during their appointment. Working at the front desk, I also schedule appointments at times that are convenient for the patient and their busy life, and verify their insurance benefits, too. Away from work, my husband and I enjoy going to our boys’ sports games, walking our two dogs, and, of course, watching our beloved Seattle Seahawks. GO HAWKS! It’s a pleasure to meet and get to know people, building good relationships with them. I do everything I can to so to it they have the best possible experience during their visits, and am always glad to answer their questions or just chat. My job involves assisting Dr. Lee during dental procedures. I sit chairside, providing him with support, but concentrating on our patient’s comfort. I check to make sure the person is relaxed, and keep them updated on what we’re doing. I really enjoy meeting new people and helping them take care of their dental needs and concerns. My days are spent working one-to-one with our patients, cleaning their teeth, examining their gums for periodontal disease, and taking X-rays. A lot of my focus is on providing oral hygiene education. I help patients understand why it’s important to keep their mouth in great shape and the best way to do it. I love seeing their smiles and hearing their thanks at the end of a visit. My husband and I love living in the country, raising our three kids, two dogs, two cats, and a few chickens, too. We enjoy snowboarding at Mt. Baker, and boating in the Puget Sound. I'm a sneaky wandering gnome and who enjoys hiding in various places throughout the office at Lee Family Dental. If your kids spot me they get an extra turn in the treasure chest!